A delicious assortment of two dozen gourmet cookies, dipped in luscious white chocolate and printed with your custom logo and message. Up to two images per basket are included. Individually cello wrapped in Willow Baskets with matching paper and ribbon. We recommend one of our logo cookie gift baskets for whenever you need to make a big impression. 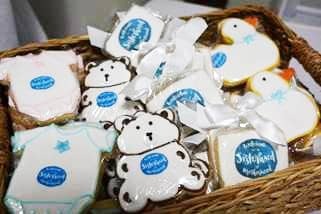 The perfect size for sharing around the office, we offer custom cookies printed with your logo in 12, 24, 36 or 72 piece cookie gift baskets. Each delicious cookie is dipped by hand in gourmet white chocolate and then printed with your full-color image. You can use a photo, drawing, logo or any other style of image you like. We print directly onto the chocolate for crisp lines and beautiful colors. You can send us up to two images per basket, leaving endless possibilities for creative designs. Our artisans sprinkle your choice of nonpareils (sprinkles) in one or two colors to match your image. The custom cookies are each heat-sealed into their own cellophane bag for freshness. Finally, your assortment of gourmet custom cookies are placed on a color-coordinated krinkle paper bed in one of our handmade Willow Baskets and tied with a matching ribbon. The finished look is truly spectacular. These 24-Piece Corporate Logo Cookie Gift Baskets can be customized for any need: promotional gifting, marketing a new product line or service offering, saying thank you to a well-performing branch or marking an important company milestone. Our Gift Experts are standing by to take any unique requests you might have - just let us know what you need by filling out the Request Estimate form above.